Is it a bird, a plane, or superman? Don’t look up, look down, or you’ll miss the exciting chalk paintings along Tasso. 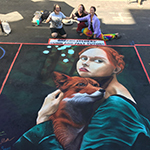 Each masterpiece is carefully choreographed through numerous hours of painstaking preparation as these artists slowly reveal their artistic creations on the pavement. The anticipation alone brings visitors back both days to watch these talented artists from start to finish, as they use pastels to create images ranging from 4ft. to 12ft. Chalk painting was introduced in Italy in the 16th century and has since flourished throughout the Europe and the United States bringing many more innovative artists to the scene to try their hand at chalk painting. This year, the Italian Street Painting Expo hosts a variety of subject matter which reflects each artists’ passion of this unique art form. Replicas of work from “old masters” to “anamorphic” styles, (whereby the artwork appears 3-dimensional from a distance or through the camera lens) will cover the pavement from Lytton to University Avenue. Returning for his eighth year, this year’s featured artist is Marlon Yanes from Redwood City. 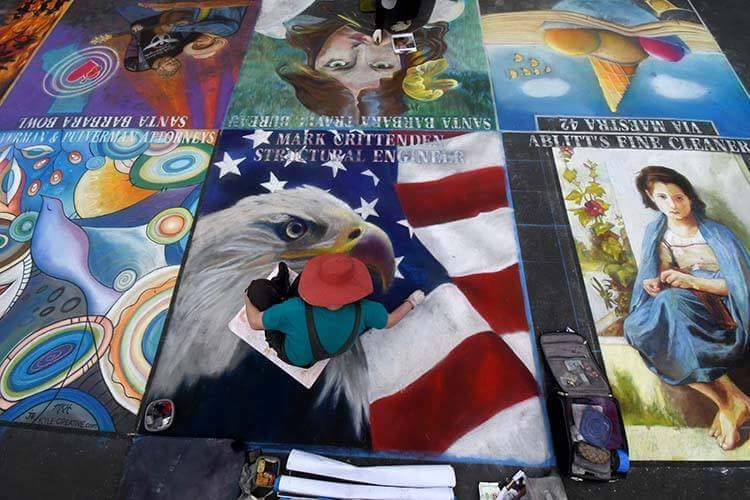 He began street painting at the Palo Alto Festival of the Arts. His larger-than-life wall murals can be seen on buildings – inside and out - throughout many Bay Area communities. 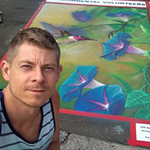 Nowadays much of his time involves office space planning and decorating, participating in street painting events in the U.S. and Europe, and pursuing a maestro status as a street painter. To see more of his artwork, visit www.instagram.com/tonitoart/. Lasting memories and a new level of art appreciation will occur after witnessing these performing artists down ‘n’ dirty on their hands and knees, creating magnificent art between the lines. If you would like request an application to be a participant in this year's Italian Street Painting Expo, click Italian Street Painting App Request. Thanks to the generosity of these 2018 sponsors, proceeds support Youth Community Service leadership and service-learning programs during the summer and school year. Particular thanks go to University Art for artists' chalk, Grocery Outlet for artists' snacks, and Hassett Ace Hardware for supplies. We also thank the Avis Family, the Blanchard Family, DeLeon Realty, DLA Piper LLP, Environmental Volunteers, Four Seasons Hotel Silicon Valley, Garden Court Hotel, the Godfrey Family, Gunn @ Your Service parents, the Hahn Family, Kiwanis Club of Palo Alto, Michael & Barbara Sih Klausner, Nobu Hotel Epiphany Palo Alto, Patrick & Cecily O'Regan, Palantir Technologies, Palo Alto Community Child Care, Palo Alto Medical Foundation, Palo Alto University Rotary, Presidio Bank, Project Safety Net, Wayne Renshaw Architect, Al & Joanne Russell, Shinnyo-en, Amanda Martin State Farm Insurance, and Michael & Rebecca Teutschel. Tonie Garza: Rafael Garza Jr.